Betron HD1000 Headphones with Bass Driven Sound £10.99 (Prime) / £15.48 (non Prime) Sold by Betron Limited & Fulfilled by Amazon. With updated and improved acoustics, the HD1000 lets you feel your music with a wider range of sound and enhanced clarity. Streamlined, lightweight, and durable, this compact headphone is more comfortable than ever. Take your music with you wherever you go, with the HD1000. Immerse yourself in an emotional experience. The HD1000 has a more dynamic, wider range of sound, with a clarity that will bring you closer to what the artist intended you to hear. Regardless of what kind of music you're into, you will feel the higher fidelity sound in your HD1000. "Feel a new kind of sound"
Sounds like Alan Partridge wrote that description! It's the biggest load of tosh I've ever heard. These are great price if you don't mind on ear headphones. 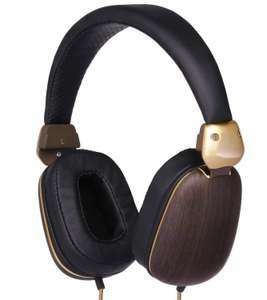 I'm sure these are excellent value, but I never see why companies make something out of plastic to look like wood, plastic to look like brass and Faux leather to look like leather... Sony don't do it on their £300 headphones. Why bother at all? "Mine arrived today, for £8 they are very good. Compared to my more expensive pairs (costing £60 & £100), not so great unfortunately - they seem to lack clarity, fidelity & balance - more for 'baseheads' I'd say, if that's your kind of thing. Again, I'll say they're definitely worth it for £8! The case is lush - on the inside at least. Would've been quite happy to pay £5 for the case alone." I'm sure these are excellent value, but I never see why companies make …I'm sure these are excellent value, but I never see why companies make something out of plastic to look like wood, plastic to look like brass and Faux leather to look like leather... Sony don't do it on their £300 headphones. Why bother at all? Great headphones, got them on a previous deal and sound quality top notch. They don't look bad in "real life" the brown is very dark nothing like in the picture, almost black looking tbh.